Will Yelp Remove Unfair or False Reviews About My Business? Will Yelp Remove A False Review? Yelp states on their website that they will not remove a suspected false review unless it violates some other term. Yelp allows lies, and even quasi-libelous reviews, as long as racial slurs are not included in the review and the review is not hearsay. If someone posts a false review, here is Yelp's advice for dealing with the problem: "We don't arbitrate disputes, so your best bet is to contact the reviewer or post a public response in order to clear up any misunderstandings." There may very well be cases where a business owner successfully has convinced Yelp to remove a false review, so I still say it is worth a try, even if the FAQs on their website seem to indicate there is no appeals process. "Yelp requires business account users to upload a real photo before messaging customers in order to make the message personal. Photos should clearly show your face (no sunglasses please) and not include too many people." In other words, I can post a lie about your business anonymously, but to respond to my "review" you have to offer a picture clearly showing who you are. The 6th Amendment to the United States Constitution gives us the right to face our accusers but Yelp does not require people who post reviews to use a real name, picture, or even location in order to protect their identity. Just because a business is public does not necessarily mean its owners or employees want their own personal identities associated with their Yelp profile page. What about corporations where no one person owns the business? Should the company pick a fall guy or a spokesmodel instead of the corporate logo? I suggest business owners use stock photos -- the people are pretty and reviewers in your hometown won't be able to spot you at the mall and go off on you while your wife and kids are with you. My biggest concern is that the ability to reply to a reviewer is not the same thing has having your name cleared, or the ability to control reviews -- or the ability to simply opt out and have your entire profile removed from Yelp. Even the CAN-SPAM Act of 2003 requires anyone sending out a newsletter to give people a chance to opt out. A review should be an assessment; the best are unbiased and simply explain why someone recommends or does not recommend a business. But those are rare, and, frankly, difficult for most people to write because our emotions do factor into what we say be they negative or positive. But many Yelp reviewers write more op-eds than reviews. Some even make accusations that, whether or not they are true, should not be said publicly unless you are prepared to back up those accusations in a court of law. The law says "presumed innocent until proven guilty." Yelp practices seem to suggest a mentality of, "accuse someone and we will assume it is true and let it stand" (because most negative reviews are not filtered.) Unlike in the legal system, there really is no appeals process for Yelp decisions. To publicly accuse someone falsely of a crime in such a way that it is likely to cause harm to reputation, is defamation, which is crime. In the case of false accusations posted on Yelp, because they are in writing, it is libel (also illegal). However, Yelp does not arbitrate and will not remove such posts, except, perhaps in rare occasions and only at its sole discretion. If you put up a sign in your yard presenting criminal accusations as fact about your neighbor it is called libel. Do it on Yelp and it is called a review. Filly F., a California woman, has accused two hospitals, a doctor, and nursing home of medical neglect and malpractice, a dentist of insurance fraud, and a private psychologist of taking financial kickbacks from a school district." May Y. of Glendale, CA, accused a plastic surgeon in one review of not having good ethics, medical negligence, and malpractice. But how many business owners being falsely accused have the time or inclination to sue reviewers? Libel is a hard thing to establish, and so business owners remain relatively powerless to fight back against false criminal or other undocumented allegations and accusations. Yelp reviews, once they are posted, for the most part stand. Even ones you believe to be outright lies. But that does not mean you should just sit back and watch Yelp's algorithms destroy your business profile ratings. First, do not buy into Yelp's sales pitches to pay for advertising. Understand what you really get, and do not get. 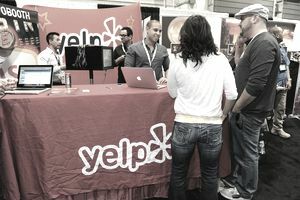 Raymond Fong, successful Internet marketer, wrote a no-punches-pulled article about Yelp's advertising services -- probably one of the best I have seen. I strongly encourage you to read it before purchasing advertising on Yelp. You can read it here: A Candid Yelp Advertising Review - Is Yelp Ripping People Off? Since business owners cannot opt out of Yelp, the best thing you can do is focus on building your online presence in other ways -- Facebook, Twitter, and through your own website. You should also consider working your brand on Google. Google HotPot is a better alternative to Yelp -- it has not caught on as fast, but the way Google deals with business owners and reviewers is more practical and fair. And, Google factors in social mentions so a review on Google HotPot may help your website in search engine results as well. If you are plagued by bad Yelp reviews, you may want to claim your business account and offer a public reply. Just remember you are doing damage control, not firing back your own defensive, or angry rant. Do what your negative posters did not do and be objective and fair. It never hurts to get qualified legal advice, but being upset about bad reviews, or being offer "advertising" services to improve your rating, is not the same as Yelp committing a wrongdoing. A good attorney can help you understand your rights and assess whether or not you have a case. They will, however, ask you for some proof that you were harmed in some way. You need documentation. If you suspect your reviews are being unfairly manipulated or your business profile is being penalized for not purchasing advertisement, you need to be able to back up those accusations. So far, no one has done that successfully and at least two lawsuits against Yelp have been dismissed. If possible, document your Yelp profile before you contact them. Complaining about bad reviews may result in Yelp offering advertising packages. There are numerous posts on anti-Yelp sites where business owners claim that once the refuse to buy advertising their profiles are changed, and their ratings go down. So pay close attention to what goes on with your Yelp profile after every conversation you have with a Yelp representative. Take screen shots, cut and paste copies of all reviews, document which reviews were public and which were filtered, and note the date and time you captured the information. Business owners concerned about their Yelp reviews should do this once a week -- certainly no less than once a month. If you talk to Yelp, try to get anything they say in writing. Send emails confirming phone conversations, even record them, and save all voice mails. If Yelp sales reps call you note the date, time, who you spoke with and what they said. Yelp has their own lawyers, and unless you really do have a unique situation and can show proof of wrongdoing, hiring your own lawyer is unlikely to get you much in the way of satisfaction. Several lawsuits against Yelp have already been dismissed by courts. But that only means so far, no one has shown enough evidence to warrant a trial. It may not help you get bad reviews removed from Yelp, but venting can feel good on its own. Here are some places to share your Yelp experiences, and read about others who have also had problems with Yelp and what they did to fight back.